We've seen some amazing cards for Hearthstone's Grand Tournament expansion so far, but today, we focus on a new batch that includes some eyebrow-raising new cards for the Druid. With Gamescom in the books, there's still some catching up to do in regards to Hearthstone's upcoming Grand Tournament expansion. With card reveals coming fast and furious, Shacknews is breaking down another handful of them today. Let's get started. This is an interesting legendary for the Rogue, but it's also quite an expensive one. It's also not very durable, as 8/4 stats are easily beatable. 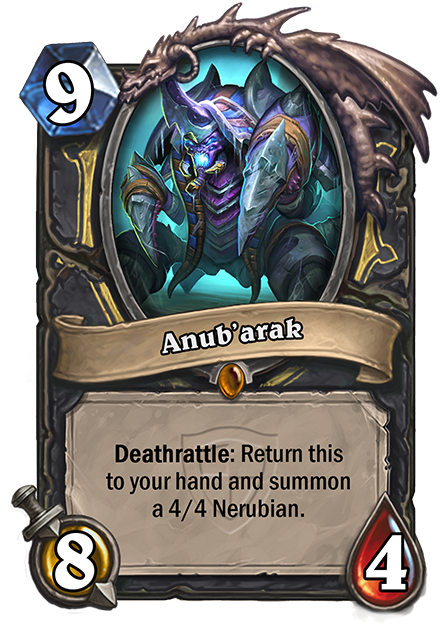 The appeal in Anub'arak will be in its Deathrattle, which will drop a 4/4 Nerubian before it goes right back to your hand to be played again. In the hands of another class, this could be deadly. However, Anub'arak is wasted on the Rogue, a class that thrives mainly without the use of expensive minions. The typical Rogue strategy centers around Preparation spells, beefing up weaponry, and excessively abusing the Blade Flurry spell. Anub'arak looks fun, but will ultimately prove unnecessary. YIKES! The Druid just hit the jackpot with this legendary. Even if Aviana looks overpriced for a 5/5 minion, the effect is completely insane. Yes, any minion will cost a single mana, meaning a Turn 10 play leaves room for just about anything. So choose your weapon. Ragnaros? Ysera? Nefarian? Pretty much any minion is in play. (Although, Deathwing is not recommended.) This suddenly makes Innervate a very precious late-game play, as it now makes room for two more minions to be summoned. But if any legendary should be played alongside Aviana, it's definitely Kel'Thuzad. The opponent will pretty much be forced to deal with Kel first, likely leaving Aviana alive for another turn and making room for a gaggle of high-cost minions to take the board. In fact, a Turn 9 Aviana, Ragnaros/Sludge Belcher, and Kel play could be far too much for any opponent to stand. 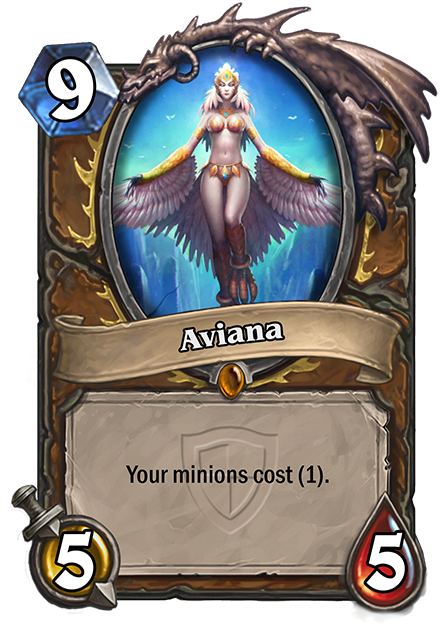 Get used to Aviana, Hearthstone players, because she'll be inhabiting a lot of Druid decks as soon as this expansion goes live. This is quite an oddity. 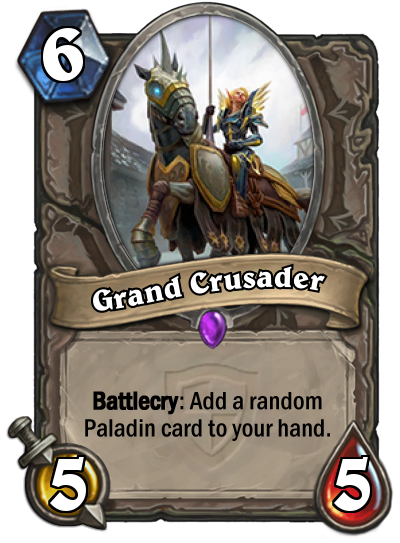 Its 5/5 stats for 6 mana are nothing special, but the Grand Crusader's effect will be a potential wild card. The effect will add a random Paladin card to your hand, which is unique in that this minion can be used by any class. Grand Crusader once again throws the player's fate into the hands of random chance. The Paladin has some powerful cards, but there's also a chance that the card drawn may not be anything particularly useful in a late game setting. I like Shielded Minibot as much as the next guy, but that wouldn't be the card I'd want to draw in this instance. And it's certainly not worth replacing Emperor Thaurissan for. Fortunately, the cheap Paladin spells could make this play worthwhile. The Paladin's Secrets, in particular, could be pretty nasty, especially in the hands of a Warlock or a Rogue. And of course, there are spells like Blessing of Kings that could be helpful to anyone. And of course, there's always the small possibility of drawing Tirion Fordring. That alone makes Grand Crusader a novelty, but the jury's out on whether he'll actually be useful compared to similar minions of this cost. You'll love this new recipe! Yes, it's Crazed Alchemist in spell form, only far wider-reaching. 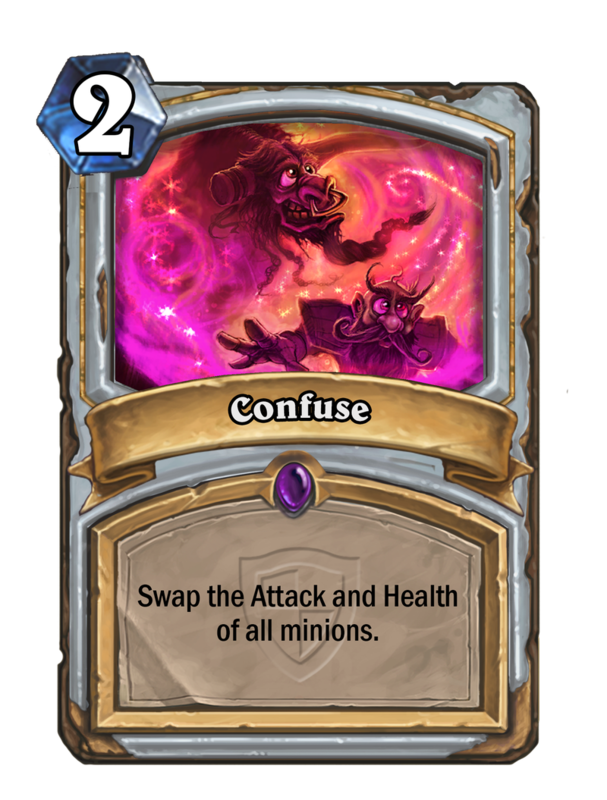 It's a toss-up as to whether the Priest could make good use of this, since more popular minions have evened-out Attack/Health stats. The Divine Spirit/Inner Fire combo would appear to be more effective for those that aren't, so why go with Confuse? The solution would be in the unlikely scenario of a Priest filling the board with low-attack, high-health minions (like Mogu'shan Warden, Deathlord, and the new Tournament Medic) before using Confuse as a makeshift Bloodlust. I can't envision that being a viable strategy, but stranger things have happened. As long as we're on the subject of Tournament Medic, may as well break him down, too. This minion isn't so much around to do damage, as he is for endurance purposes. Using a Hero Power will restore 2 health, giving him something of an effect similar to Vitality Totem or Illuminator. This effect can be key in the late game for Warlocks that still need a card draw or for Hunters that still want to go for the face, but are taking more hits than expected. But as discussed with Confuse, the biggest beneficiary might be the Priest, who has the double benefit of beefing him up with Divine Spirit and Inner Fire for a 16/16 monster. 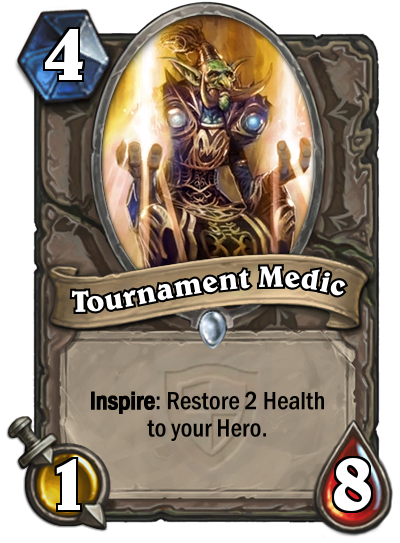 Tournament Medic has no shortage of uses and health recovery is pretty much welcome in all cases, so look for him to quietly become a solid addition to most decks. 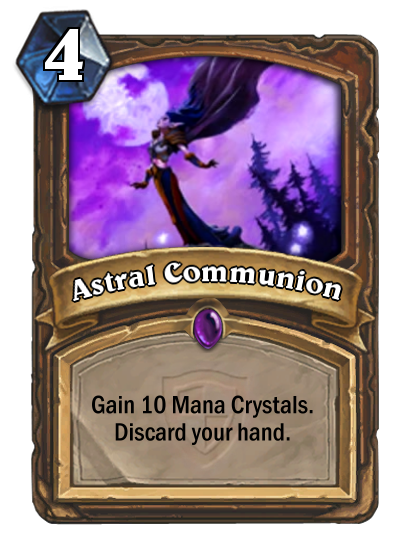 (4) Astral Communion - Gain 10 Mana Crystals. Discard your hand. Upon first glace, this looks like another advantageous spell for the Druid. Potentially go to 10 mana crystals as early as Turn 3 with the help of a coin. But let's get over that initial excitement and ask whether the drawback is really worth it. On the surface, it appears to be an emphatic "no." Why potentially squander a perfectly good hand? This is where card draws are going to be essential, because what good is 10 mana crystals if there aren't any cards to play? Card draw minions like Loot Hoarder or Acolyte of Pain will definitely want to be on the board prior to playing Astral Communion. But let's face it, this could be a very costly play and one that may not be worth taking, especially with legendaries like Aviana out there providing better rewards for greater patience. There's still much more to go with the reveals for Hearthstone's Grand Tournament expansion. Shacknews will continue its ongoing analysis of these new cards throughout the week, so stay tuned for more, as we continue our series.